How do I configure a secondary private IP address for my Amazon EC2 instance? I want to configure a secondary private IP address for my Amazon Elastic Compute Cloud (Amazon EC2) instance. How do I do that? You can assign a secondary private IP address to an Amazon EC2 instance when you launch the instance. If you already launched the EC2 instance, a secondary private IP address can be assigned to the network interface. Assign the secondary IP address to your instance. For more information, see Assigning a Secondary Private IP Address. Configure the instance OS to recognize the new IP address. 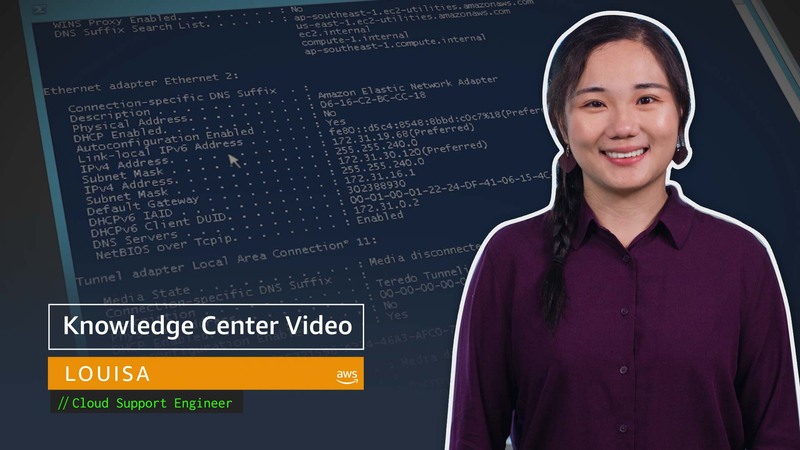 For Amazon Linux, see Configuring Your Network Interface Using ec2-net-utils. For Windows Server, see Configuring a Secondary Private IP Address for Your Windows Instance. (Optional) If you need a public IP, associate an Elastic IP address with your new IP address and confirm the new address. For more information, see Associating an Elastic IP Address with the Secondary Private IP Address and Viewing Your Secondary Private IP Addresses. Note that if you have more than one Elastic IP address on an EC2 instance, there are charges that apply. For more information, see Elastic IP Addresses on Amazon EC2 Pricing.